We write VBA code in a VBA module to perform our actions in Excel. We then execute this macro in any of various ways. VBA modules are stored in Excel workbook. You can store any number of VBA modules in a workbook. 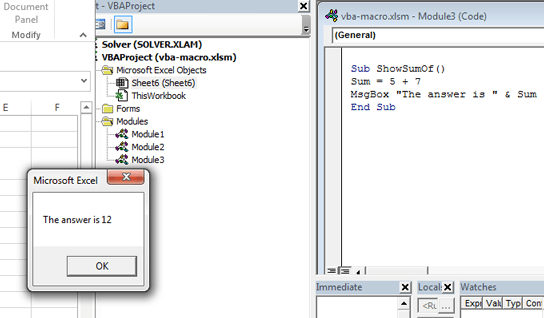 To view or edit a VBA module, you have to activate the VB Editor window. To change between Excel and the VB Editor window, press Alt+F11. A VBA module may also have function procedures. A function procedure internally performs calculations and returns a single value. A function can be called from another VBA procedure. You can also use the function directly in a worksheet formula. Here’s an example of a function named AddTwoNumber. This function sums two values, which are supplied as arguments, and returns the result. VBA works with objects. Excel provides more than 100 built-in objects that you can work with. Almost everything you create is the object. Examples of some objects are: whole Excel, a workbook, a worksheet, a cell range on a worksheet, a chart, and a rectangle shape. Objects are arranged in a hierarchy. An object can contain one or more other objects. Excel itself is an object. Excel’s object name is Application. Excel holds other objects such as Workbook objects. The Workbook object holds objects like Worksheet objects and Chart objects. A Worksheet object can hold Range objects, PivotTable objects, and so on. Same type objects form object collections. For example, all worksheets in a workbook make the Worksheets collection. In the same way, all the charts on a worksheet make ChartObjects collection. Collections are also objects. We refer an object in our VBA code specifying its position in the object hierarchy. We separate objects with a period (.) separator. Objects have properties. A property is basically a setting for an object. For example, a Range object has many properties: Value and Address are two of them. A Chart may have a title, type, and many other settings. These settings are Chart object’s properties but maybe in the different name: HasTitle and Type. We can use VBA to set object properties. We can also use VBA to change the values of properties. Objects have methods. Using a method you can perform some specific job with the object. Methods are of both types: built-in and customized. For example, Range object has a built-in method: ClearContents. This method clears the contents of the range. VBA also includes all the constructs of modern programming languages, including typed variables, arrays, looping, debugging aids, and so on. We have described VBA in a nutshell. We shall enter into details step by step in next articles. We shall develop some real-time projects with VBA. This is a long journey to be expert in VBA. Keep in touch.